…and far too many other titles for me to list right here. I have way too many projects and far too little time. I know: not exactly ground-breaking stuff, but when you’re staring into the bark of a tree, it can be hard to see the rest of the forest. Allow me to see everything that is happening in the weeks ahead. Easily integrate with other tools that I always use. For years, I’ve used services like Hootsuite and Buffer off-and-on. There was always one reason or another that I would eventually stop using those services. Don’t get me wrong, those services are really fantastic, but they always lacked something or charged too much for what I needed. I love Buffer, but they don’t allow me to manage my editorial calendar, and that’s fine, because they don’t want to do that. Buffer wants to be good at one thing and that is scheduling posts to social media platforms. And for that they do a great job. I needed a solution that would allow me to centralize all of my text based content creation. I was looking for something that would allow me to better schedule my time. I’m constantly working on multiple projects and it makes it really hard to focus on one thing in particular. There are about a billion tools out there that can accomplish some portion of my requirements. I found a few options that were available to me. It needed to allow me to plan content for multiple sites (preferably in one place). Content editing in one place for multiple sites. Basically, I wanted to plan, manage and promote content from multiple websites in one place without having to log into the WordPress admin areas. Before I launch into the results, I want to be fair to CoSchedule. Not everyone is as technical as I am. I also needed very specific things and fell into, what I believe is, a hole in their pricing model. Their support was superb and responsive. 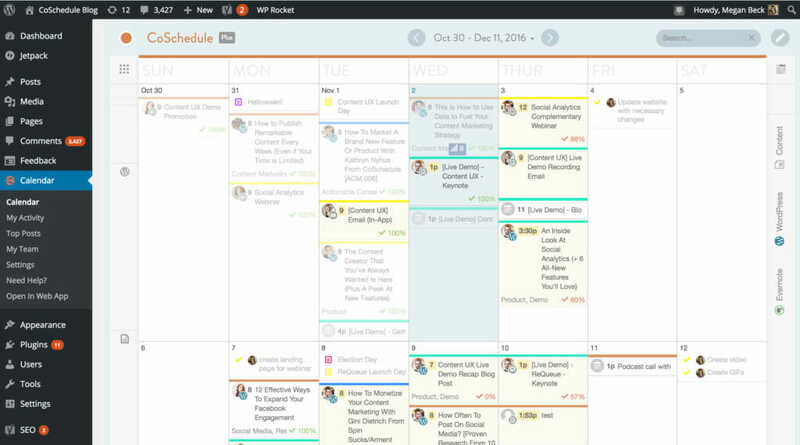 I believe the majority of people will probably be served well using CoSchedule. I think it just fails for people who are in my situation. Centralizing Everything: MainWP Plugin – Free or $340 (with coupon). I bought the full suite for $340 even though it wasn’t required. Social Media Posting: I use two plugins and Buffer, but Post Promoter Pro on its Own is more than enough for most people. Post Promoter Pro: $349 – Schedule posts to my Social Media Accounts. WordPress to Buffer Pro: $149 – Automatically Buffer new posts and updated posts to Social Media Accounts. Buffer Awesome Plan: $10/month. This allows me to schedule posts to all of my social media accounts. 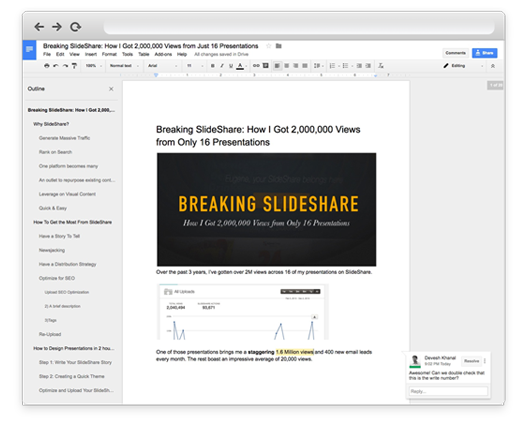 Google Docs to WordPress: Wordable.io – $19/month – Takes Documents from Google DocManagings and turns them into beautifully formatted WordPress posts. Editorial Calendar: Editorial Calendar for WordPress plugin. Free. For those who don’t want to read the whole analysis, CoSchedule is a great tool in my opinion, but way over priced for people like me. If you have one website, it’s an OK value. If you run multiple websites, then their pricing scales horribly, and doesn’t offer the value you probably need. You quickly realize that this tool is either meant for people running a single blog, or enterprises that can afford multiple hundreds of dollars to thousands of dollars each month. I unfortunately fell in the middle, and CoSchedule clearly misses the mark on the middle market. CoSchedule is a pretty neat tool. I was impressed with all of the offerings they had while I was reviewing their feature list. It would allow me to plan all of my content in one place, it would allow me to schedule all of my social postings, and it would allow me to easily visualize everything all in one place. On top of that, CoSchedule integrates with other services that I use such as Google Docs and allows you to edit content all from one place! For me, CoSchedule is a content management and distribution platform. What do I mean by “for me?” Because CoSchedule is flexible, it can do many things. For me, it allows me to centrally plan my content and schedule social media postings to promote my content. They also have a Chrome browser extension that allows you to easily curate content that you find and schedule it to your social networks. I wanted something that could centralize my online activities but also something that would sit inside of a single WordPress installation. That was the hard part of my requirements. If I’m managing multiple websites, I want to be able to log into one of those websites, see my editorial calendar but still have access to see all of the content on all of the other parts of my business. Unfortunately, CoSchedule doesn’t do that. It only syncs with a single calendar in your CoSchedule account. This isn’t much better than the free WordPress editorial calendar plugin that is currently available. It does let you easily see all of your websites’ editorial calendars in the CoSchedule.com dashboard, but you can’t publish content to them from inside CoSchedule. You have to be taken to each website’s dashboard. This is one of the areas that CoSchedule does really well. It allows you to schedule posts easily across multiple networks for multiple sites. They do it well, but it’s not much easier than Buffer which I already use. It is a bit more seamless than buffer because it is centered around promoting your content. Buffer is less focused in this respect. If you write content in Google Docs, then you know how horrible it can be trying to turn that document into a WordPress post. Sure, you could simply copy and paste the article, but take a look at the HTML. It is awful. Google Docs fails so hard when it comes to clean HTML. I don’t know why, I probably never will, but it is terrible. Lots of inline styles are added to your HTML and it makes for a nasty experience. I didn’t get to test out CoSchedule’s implementation because I quickly realized how much my monthly costs were adding up. The fact that they have it though, tells me they know there is a problem with how Google Docs handles HTML. In order to get this integration, you have to at least be on their $30/month plan. This is the central reason that CoSchedule exists. They centralize your editorial calendars. They do a good job of this, but if you run multiple websites, be prepared to hurt. Their pricing plan does not care at all about how much business you give them until you’re into their agency plans. It has an analytics dashboard that integrates with Google Analytics. I think this is a pretty cool feature, but I’m already always inside Google Analytics and Buffer (although, Buffer’s reporting is pretty lame on the $10/month plan). Their support team was nice and responsive. I’m not sure if it was a fluke for me or not, but I didn’t get a response over the weekend. My guess is that their support people get the weekend off. I don’t really care about that. I’ll gladly wait 2-3 days for a support request to be answered if it means a company is treating their employees well. I feel the same way about holidays. If a company is working employees on holidays, it lowers my opinion of that company. 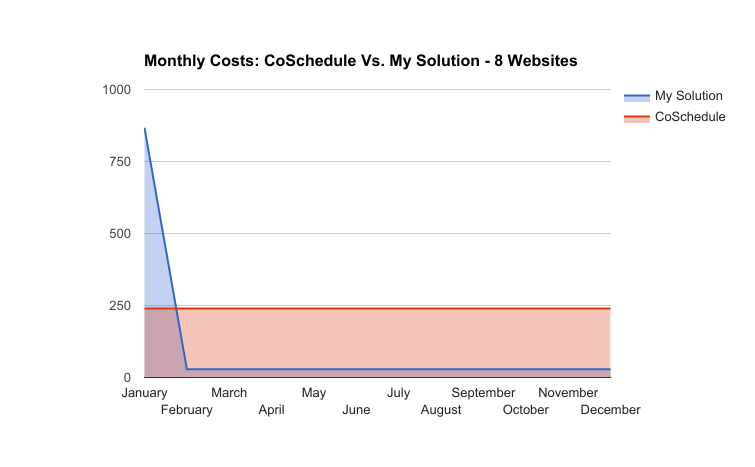 For a single website, or an agency, I think CoSchedule can be a great value. I expect all tools to have a semi-steep initial cost, but then have the costs taper off for the more business you bring them. I think $30/month for one site is perfectly acceptable. Once you add in multiple sites, then I expect the costs per site to drop a bit. That is not the case with CoSchedule. The costs compound. I’m not sure if this is a technology limitation on their part that they just have to live with, or if this was a conscious decision. Unfortunately, while the service they offer is kind of unique, for the prices they’re charging, I was able to cobble together a much cheaper solution. My Verdict: Is CoSchedule Worth the Cost? For me, no. 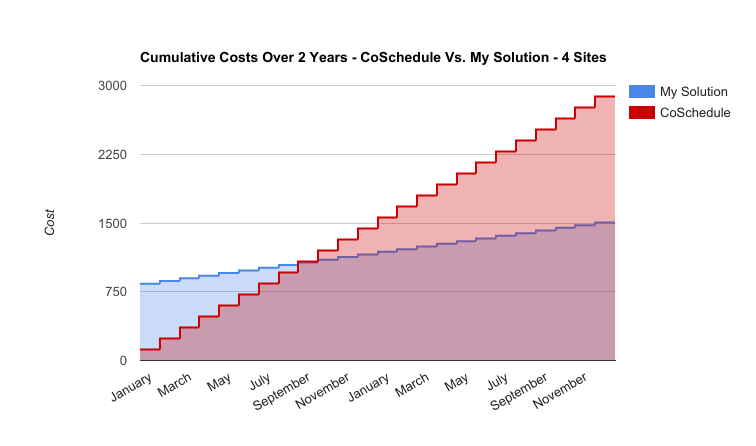 I have a superior solution in my eyes that will save me thousands over a couple years compared to CoSchedule’s costs for me. Getting to the point, CoSchedule will give you your time back. It wasn’t perfect for my use case, but it might be for you. And there’s nothing more precious to an entrepreneur than their time. By centralizing a lot of your everyday tasks, you will get back huge quantities of time. I don’t know how much you value your time, but if it exceeds the monthly costs of CoSchedule, then you should check it out. For me, I have a much cheaper solution that gives me back just about the same amount of time. Even more if you count some of the features I got such as centralizing website maintenance. My solution offers a superior centralization solution using Main WP. Yes, I have to be in each website’s dashboard in order to see the editorial calendar and edit content, but I would have to be in each of their dashboards anyways to edit the content with CoSchedule. It’s not that big of a jump to adjust to looking at the editorial calendar while being in the site as well. My solution allows me to update WordPress, my plugins and my themes in one place as well as schedule all of my backups. My solution has a better social media solution in my opinion. 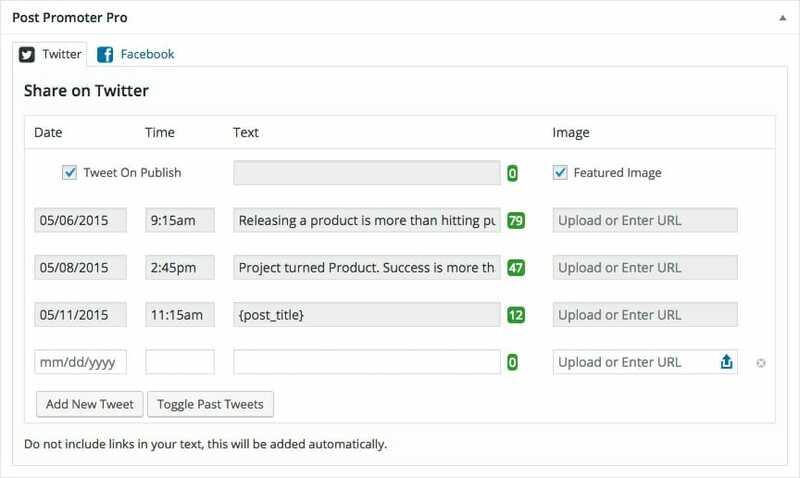 Not only will it automatically go to my social networks when I publish an article (via Post Promoter Pro plugin and the WordPress to Buffer Pro plugin), but it will also automatically schedule posts to Buffer when I update my article (via the WordPress to Buffer plugin). Additionally, with Post Promoter Pro, I can schedule as many messages as I want to go out to Twitter, when I want them to go out. For the bargain price of $19/month from Wordable.io, I can send any articles in Google Drive to any WordPress site I want. No caps or limitations. When I was searching for an editorial calendar there was a WordPress Editorial Calendar plugin that kept popping up that was free and looked like a good idea to me. But there was one problem: the plug-in would only allow me to plan the posts for one website. Considering this is basically how CoSchedule works as well, this was the plugin I decided to go with. The upfront costs for the way I do things are substantial to many people. I almost always buy the lifetime/unlimited licenses when available. The annual licenses are much cheaper upfront for all of the software I use, and some (like Main WP), you’ll get basically all of the benefits I do using their free version. I bought the ultimate bundle because I wanted some of the extra functionality that isn’t core to what we are discussing in this article. Basically, you could probably cut upfront costs easily in half by purchasing annual licenses that renew. My Verdict: Is My Solution Worth the Cost? If you run multiple websites for any reason, then I believe my solution is your better option. 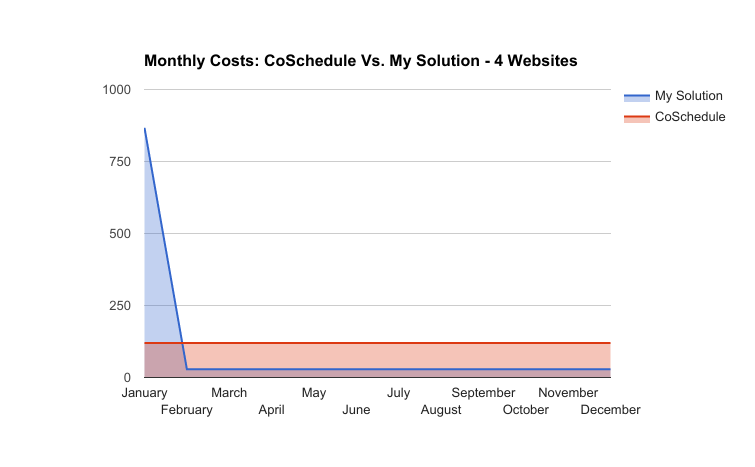 If you only run one website, then I would suggest going with CoSchedule. If you’re an agency with lots of people and a need for collaborative content creation, then I would also suggest going with CoSchedule. My solution works for me because I’m one of the few people involved with my business, and all content collaboration happens inside Google Docs which means I don’t need CoSchedule’s collaboration features. Thanks for the great review, our team really appreciates it!